2nd from the right in the back row is surely Raymond Maclean. Irene, you sure it's '54, cos' on the front row I think is Rosemary, yourself, Pauline Gilmore, Jane Mackay, Heather Hossack? and Iris Maclean, I also think that on the back starting from left is Brian Morrison ? ? ?then Douggie Macphee next to Raymond. The people in the photograph are my contempories and so the date could be 1964 rather than 1954. Certainly early 1960s. 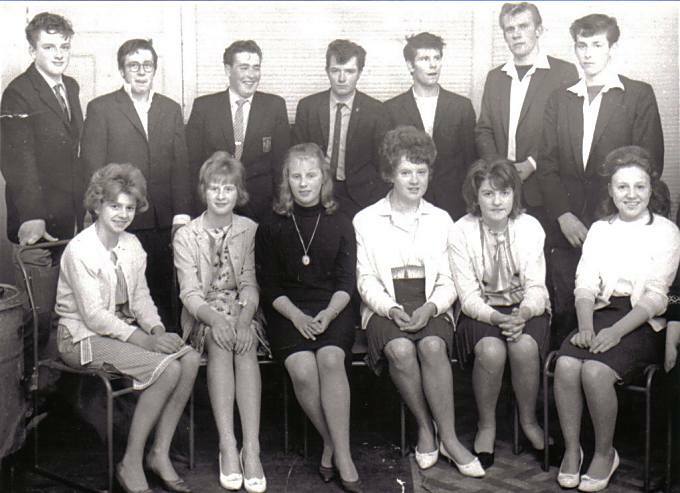 Front row last on right Iris Maclean (Macphee)? Im sure that that fourth from the right back row is Eric Maciver my brother in law !!!!!!!! Oh dear Susan......Don't let Rosemarie hear you calling her Rosemary! Kinda touchy!!!! Far right I think is Douglas kelly ? Front row from left: Rosemarie Hogg, Irene Howse, Pauline Gilmour, Jane Mackay, Heather Hossack and Iris Maclean. Taken in November 1961 when youth club had set up again with Douglas Macphee as President, Jane as Secretary and Rosemarie as Treasurer. Tom Munro, Church Street was the adult in charge of us all - brave man!